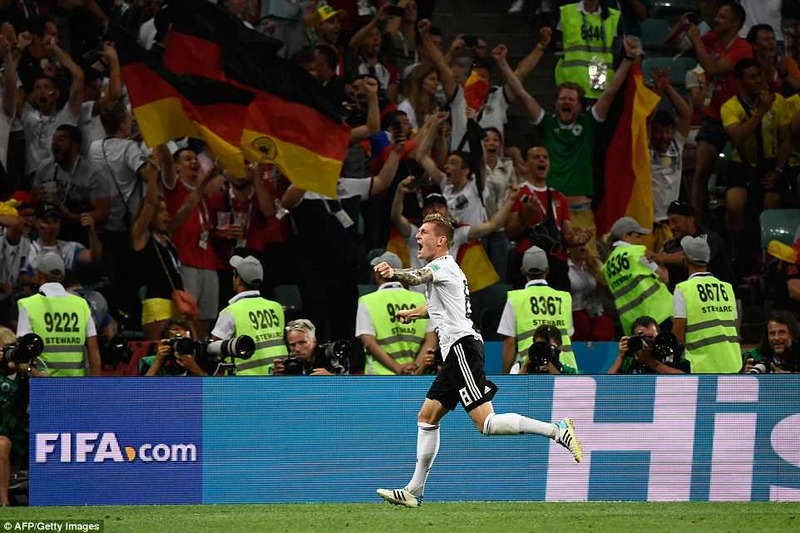 Germany survives scare for memorable win! 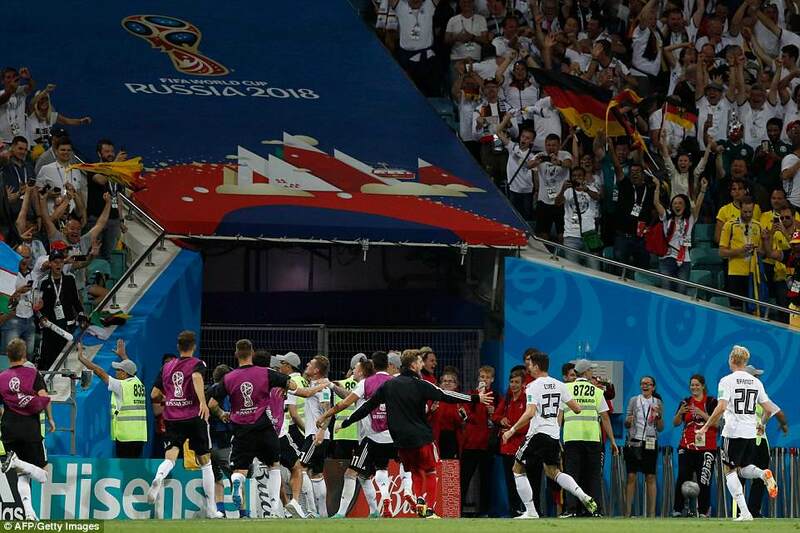 For a short time, just over half an hour including the half-time interval, Germany were on their way out of the World Cup. For much longer they were in deep trouble, unable to find the winner, teetering on the brink and vulnerable. 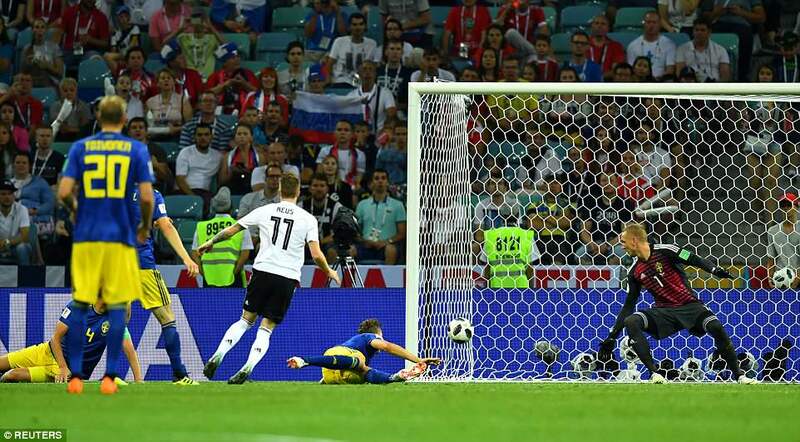 Then, five minutes into stoppage time and down to 10 men, up stepped Toni Kroos to fire a free-kick from wide on the left swerving past the dive of Sweden goalkeeper Robin Olsen. 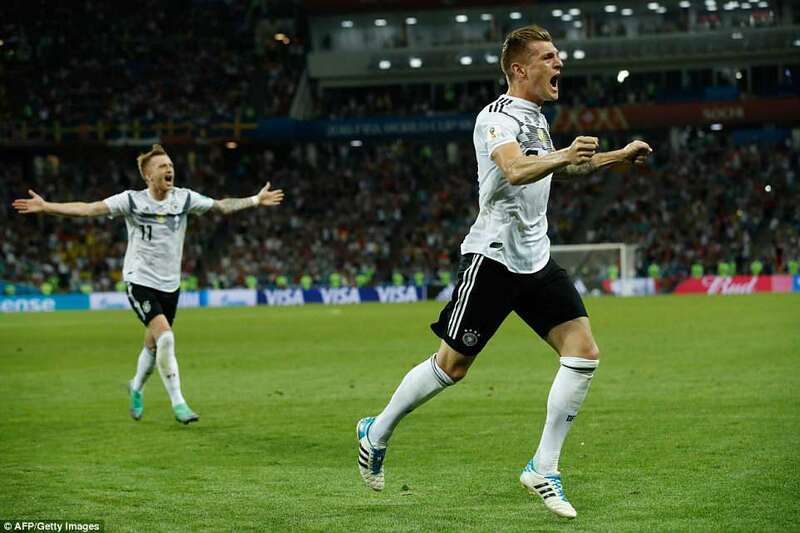 Germany 4-2-3-1: Neuer 6; Kimmich 6.5, Boateng 5.5, Rudiger 6, Hector 6 (Brandt 87); Rudy 6.5 (Gundogan 31 min, 7), Kroos 7.5; Muller 6.5, Reus 7, Draxler 5 (Gomez 46, 6.5); Werner 6.5. 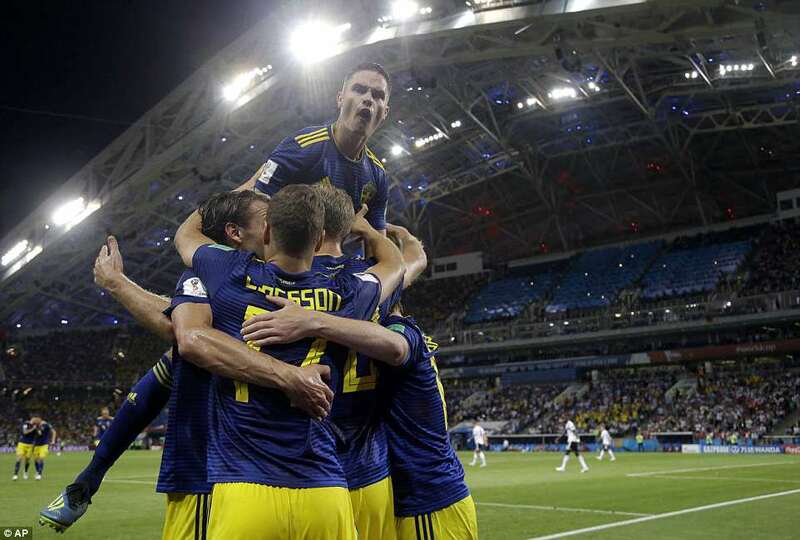 Sweden 4-4-2: Olsen 7; Lustig 6.5, Lindelof 6.5, Granqvist 7, Augustinsson 6; Claesson 7.5 (Durmaz 74), Larsson 6, Ekdal 8, Forsberg 6; Berg 6.5 (Kiese 90), Toivenen 7 (Guidetti 78). 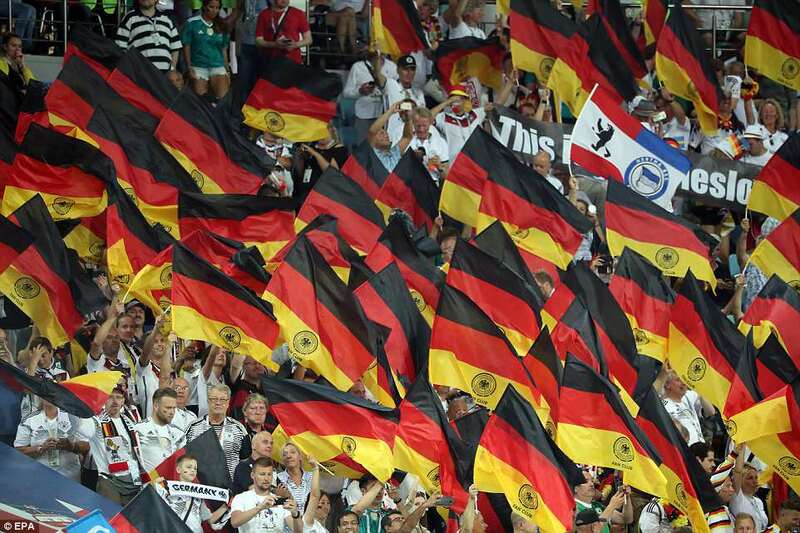 Germany breathed again and the crisis washed away. 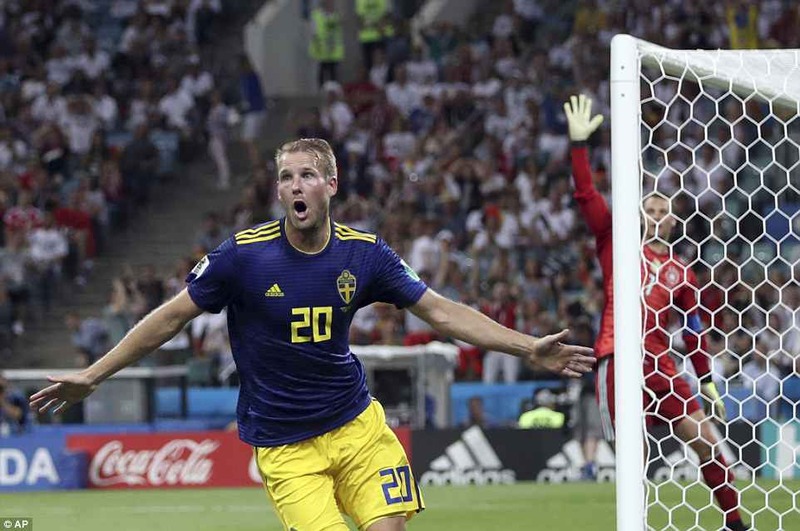 Initially they had trailed to a goal by Ola Toivonen and it might have been more and their ruthless efficiency had vanished, replaced by reckless abandon. 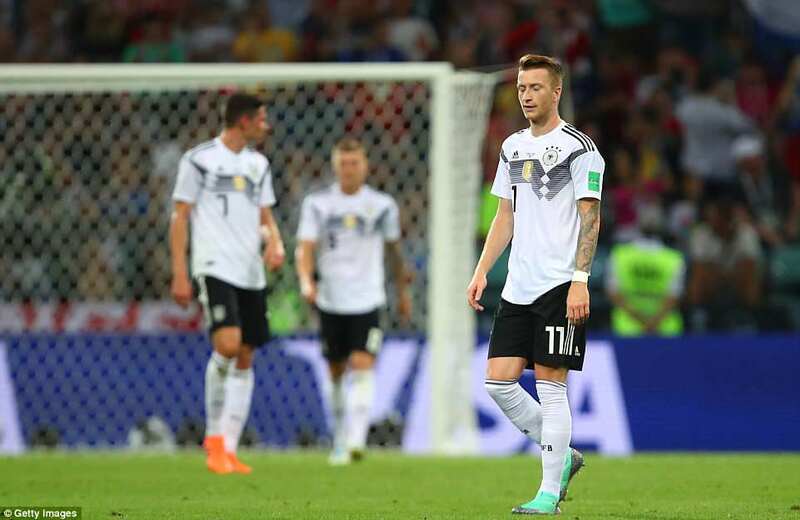 Just as against Mexico in Moscow, the result which triggered a rare crisis amid German ranks and fuel the curse of the champions. This century, Spain, Italy and France have all failed to make it through the group stage when defending the title. 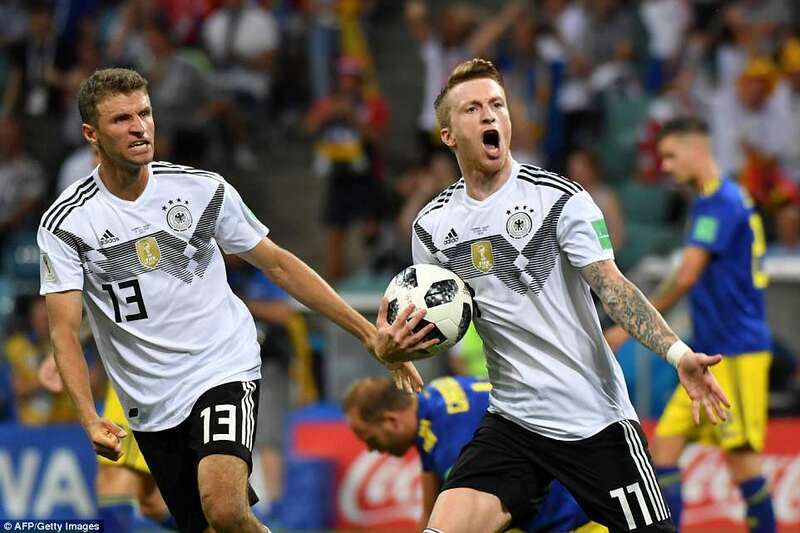 Marco Reus equalised early in the second half and they gave everything in search of a second but Sweden defended well and rode their luck. 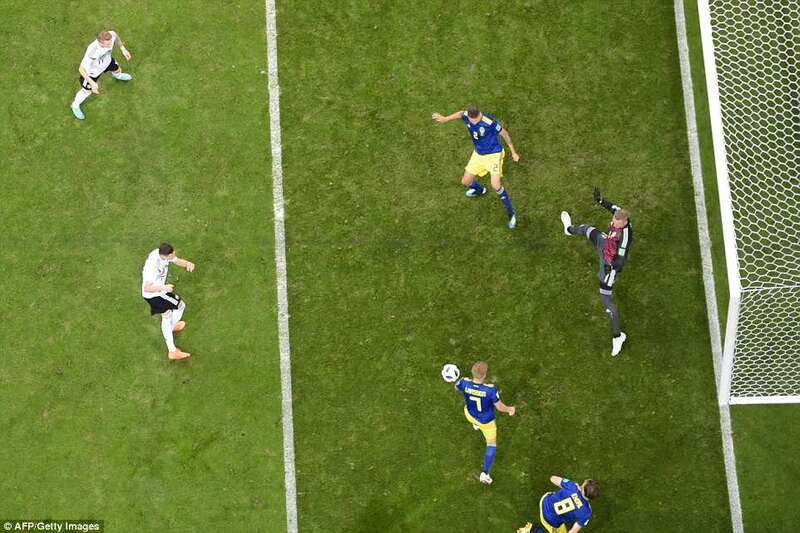 Timo Werner skied a good late chance and Robin Olsen turned over a header by Mario Gomez with a fine reflex save. 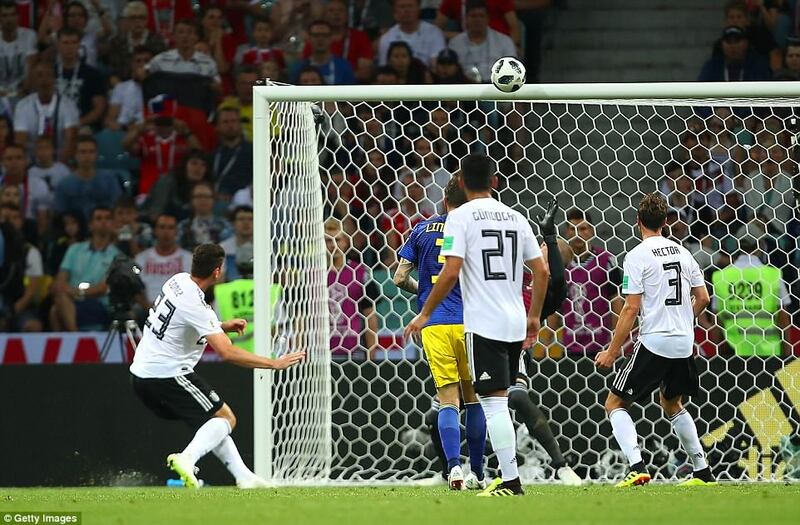 Julian Brandt struck a post with a sweet left footer in stoppage time and Werner could not turn the rebound on target. 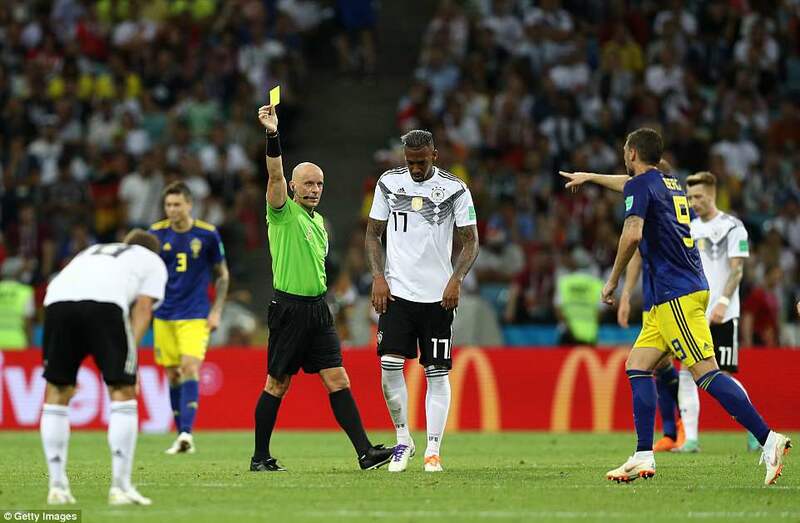 Jerome Boateng was sent off for a second yellow card after the intervention of the video assistant referee. 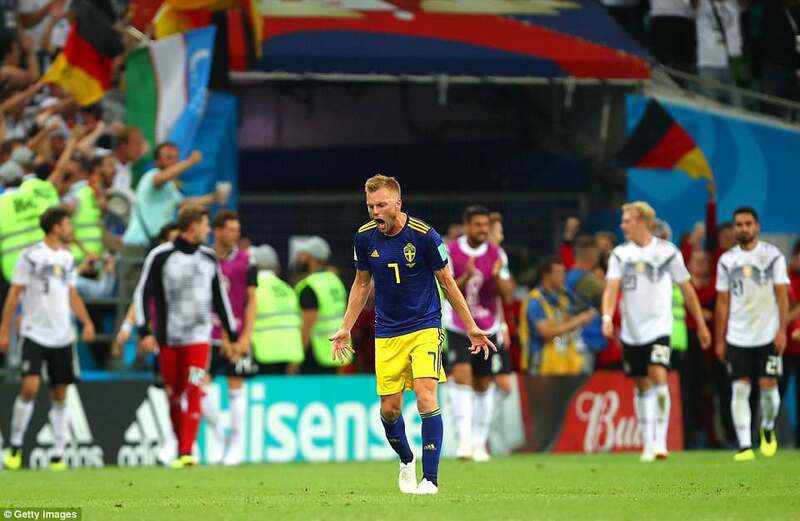 Then Kroos, at fault for Sweden’s goal in the first half, made amends in the most remarkable fashion and the holders are back in the game. When Low spoke of trust and confidence on the eve of the game, he did not sound like a manager set to tear up his team to satisfy his critics but there were four changes. Among them Ozil, always the subject of so much debate when Germany lose, a familiar story for anyone who has followed the story of his career at Arsenal. 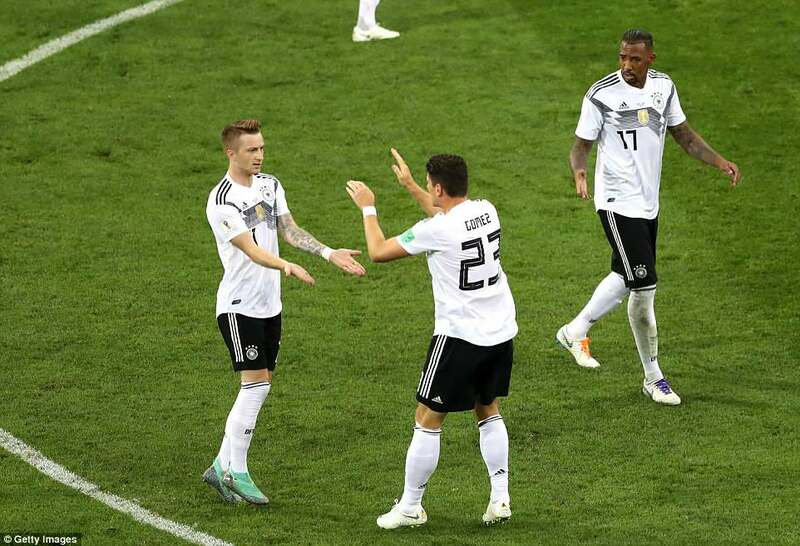 Sami Khedira was also out as Low injected pace into the team with Marco Reus taking Ozil’s place and Sebastian Rudy called into midfield to partner Toni Kroos. 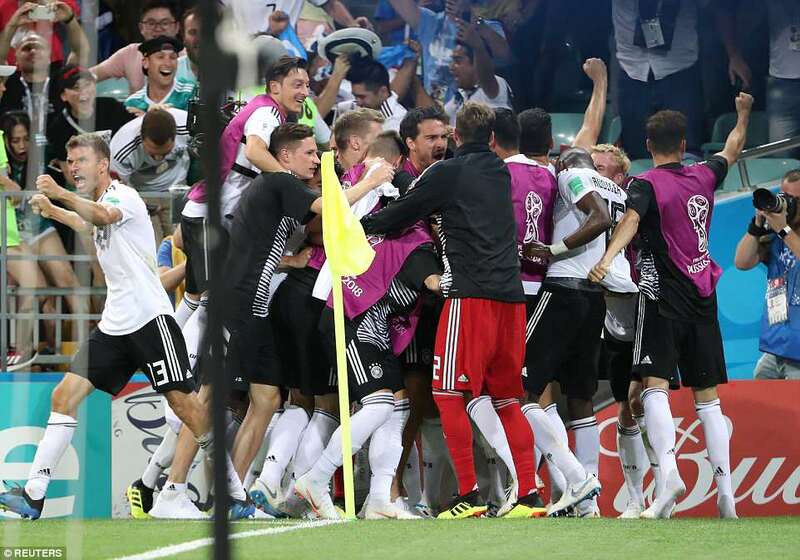 Toni Rudiger replaced Mats Hummels who has a neck problem, Jonas Hector returned at left back and Germany came roaring out like a team with a point to prove. 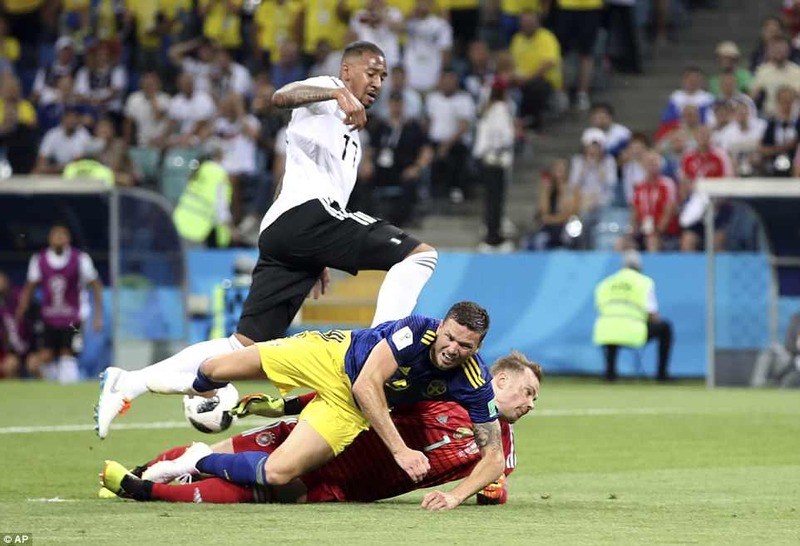 Full-backs were pushed forward and the tempo turned to breathless as early attempts by Julian Draxler and Hector were blocked and the Swedes scrambled around, deep in their own penalty area making desperate blocks and hurried clearances. 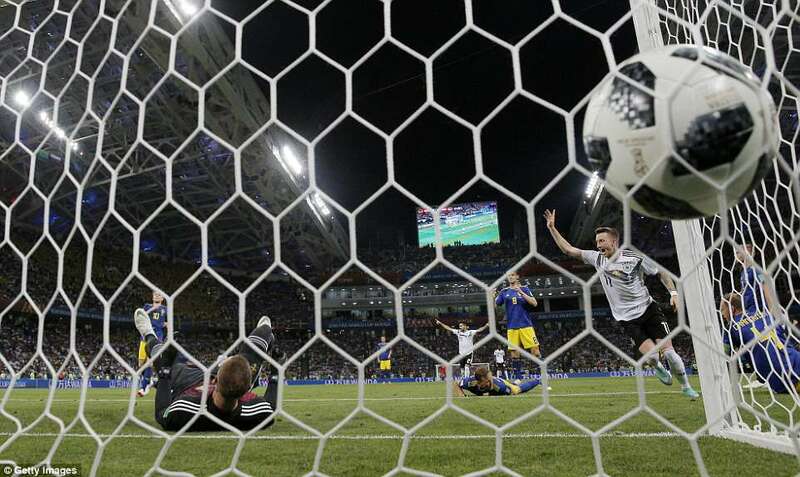 Sweden were without centre-half Pontus Jansson, one of three players struggling with sickness ahead of the game, but they survived the early storm and, just like Mexico, caused big problems for the holders on the break. 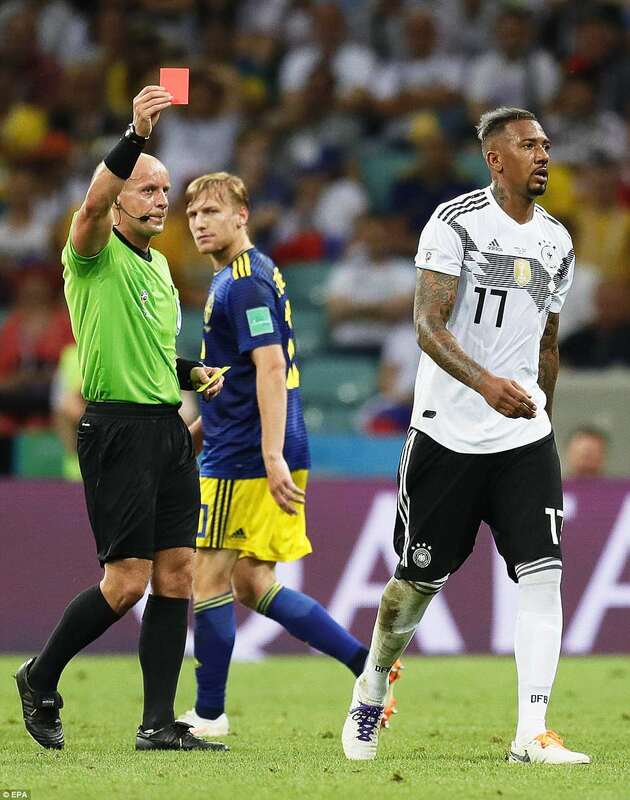 Germany were fortunate to escape what appeared to be a certain penalty when Boateng barged into Marcus Berg as he prepared to shoot, having been released by a pass from Viktor Claesson. The clumsy challenge looked like a foul at the time and it looked like a foul on the television no matter how much it was slowed down and replayed. Boateng had been caught out and was trying to disturb Berg but barged him over and the striker prepared to shoot. 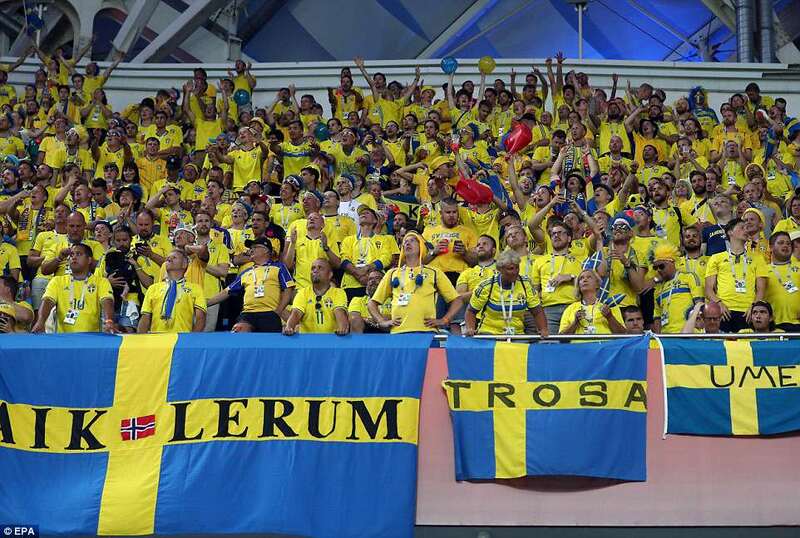 The Swedes went berserk when it became clear Polish referee Szymon Marciniak did not award a penalty. 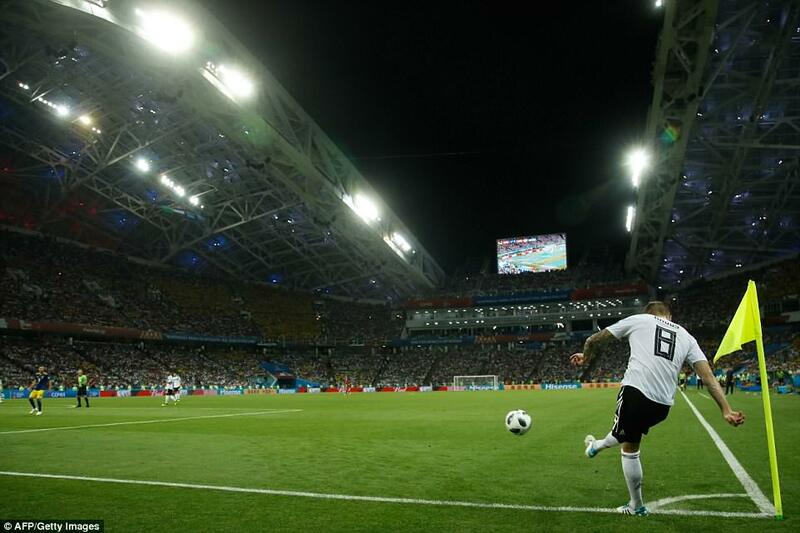 Even as Germany carried the ball down the other end of the pitch, the game existed in a state suspended animation as 50,000 spectators waited for an intervention from the video assistant referee. 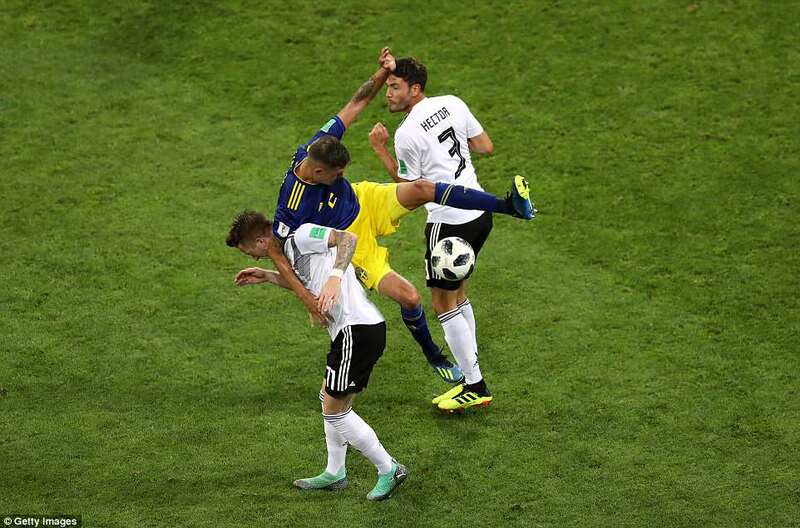 That did not come either, another question for the VAR system to consider, but the incident knocked Germany’s confidence and they lost their rhythm. Then they lost Rudy, accidentally kicked in the face by Toivonen, and forced off as the medics tried to stem the blood gushing from his busted nose. 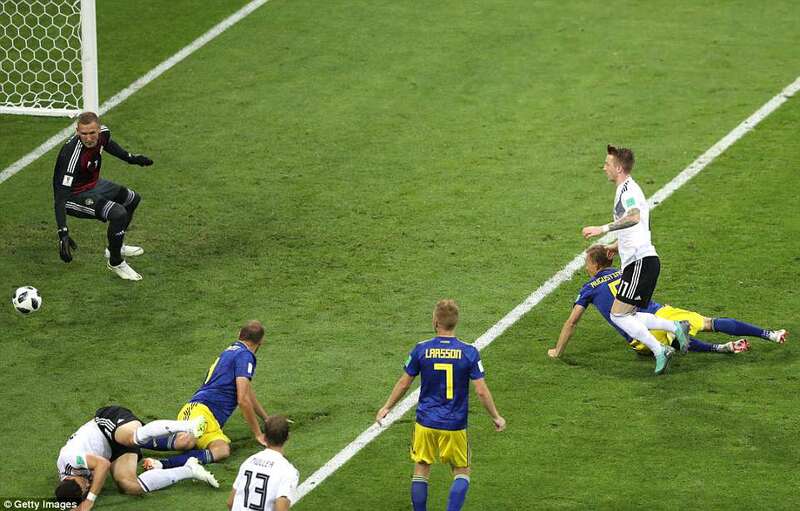 It was then Sweden who took the lead, another wonderful move slicing through the white shirts on the turnover when Kroos lost the ball cheaply in midfield. 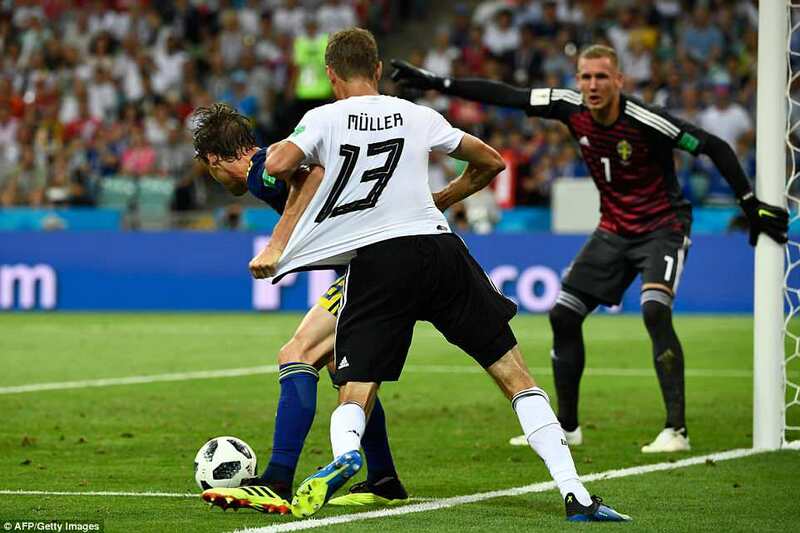 Claesson picked out Toivonen and the splendid pass was matched by a touch with his chest and the finish lobbed over Neuer from an angle while under pressure from Rudiger. 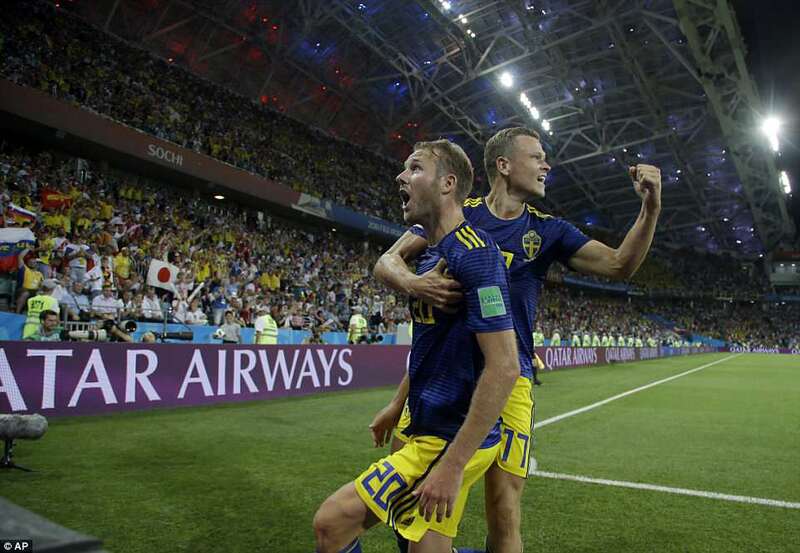 This time the Swedes celebrated. Rudy was unable to continue and was replaced by Ilkay Gundogan, who made an instant impression with a long-range effort which took a deflection and forced a brilliant save from Robin Olsen. 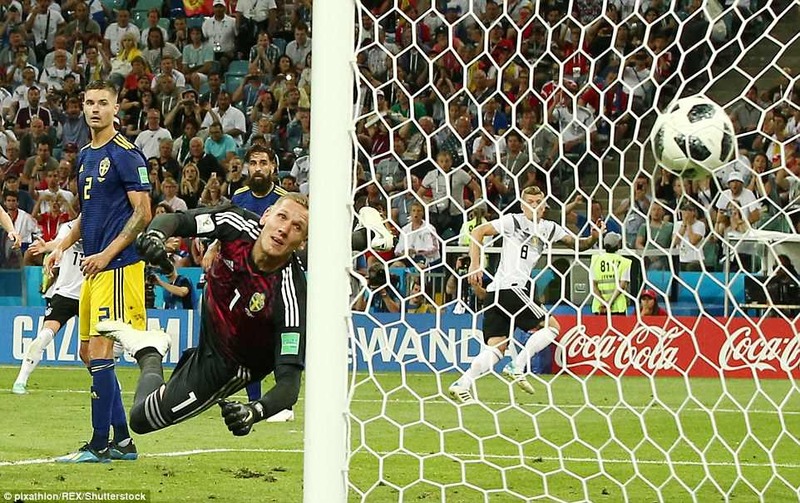 Goalkeeper Olsen and Mikael Lustig combined to prevent Thomas Muller from bundling the rebound into the net. 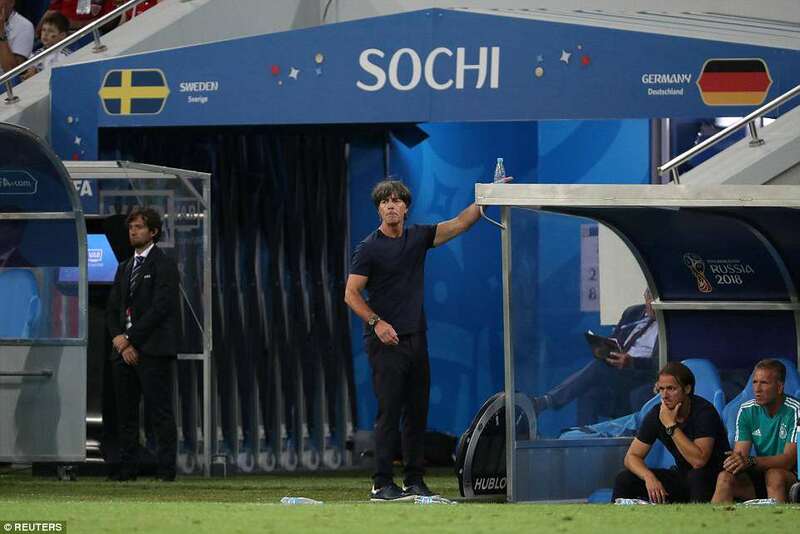 Still, the Germans wobbled at the back. 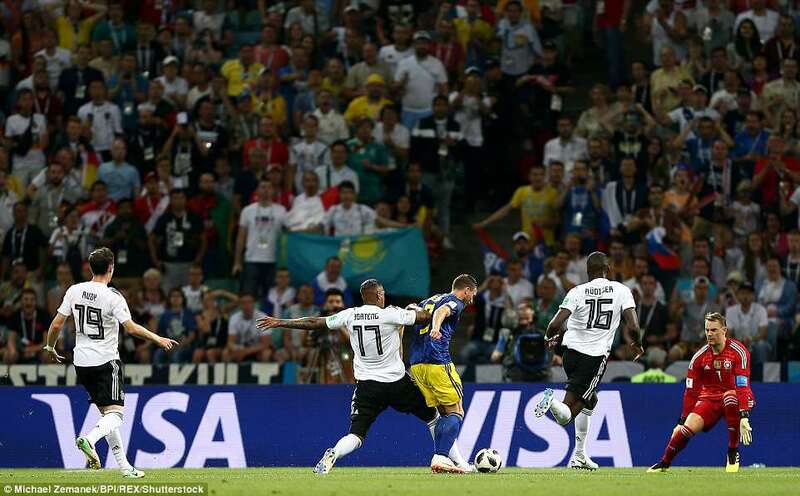 Claesson’s touch let him down in front of goal and Neuer took off to his right to reach a flashing header by Berg from Sebastian Larsson’s expert free-kick delivery. 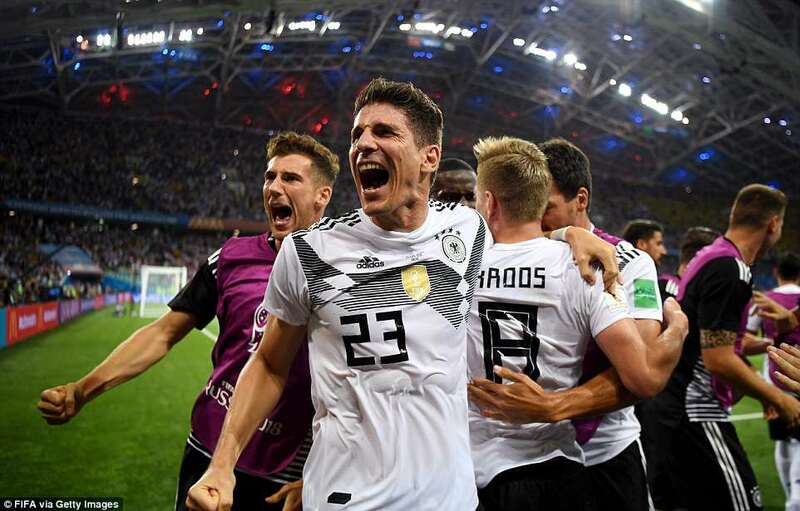 Low sent on Mario Gomez to replace Draxler at half-time and his team started the second half as they started the first. This time, however, they found the net. 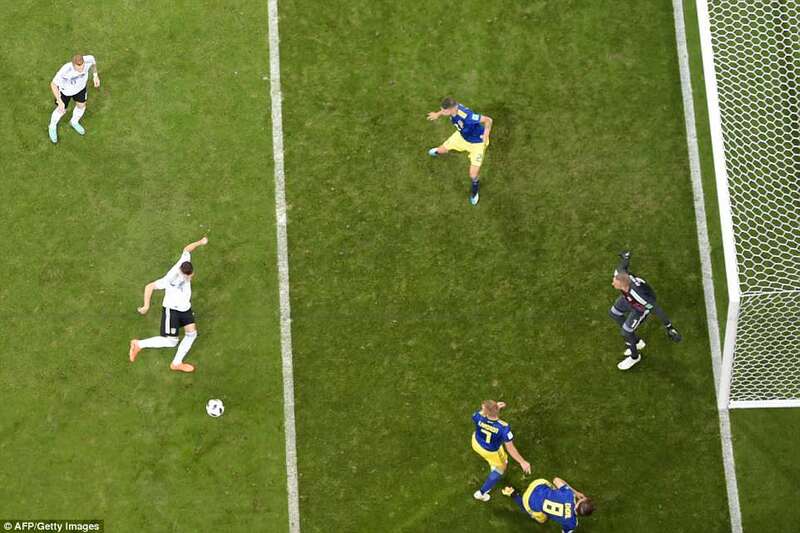 Werner’s low cross from the left evaded Gomez at the near post and Reus arrived to turn it past Olsen, despite making scruffy contact on the ball with the inside of his left knee. Germany did not care about the aesthetics by this point. They were clinging onto their title. 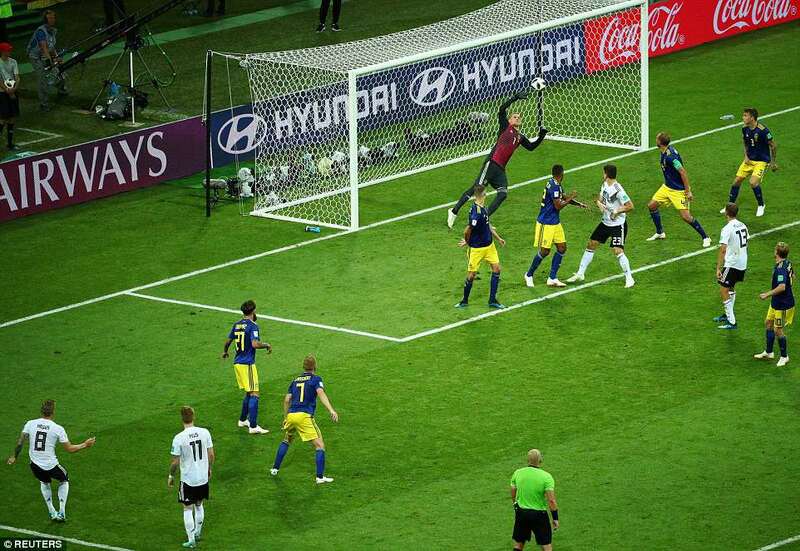 But the winner from Kroos was simply sublime.